Who will make medical decisions for your child? Legal decisions? Financial decisions? Educational decisions? What is the best way to leave money or other property to your child? How can you maximize your child's eligibility for "public benefits" that might be available? What is a Revocable Living Trusts? 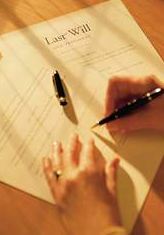 When to Start Thinking About Estate Planning. What differentiates a Special Needs Estate Plan from a "Regular" Estate Plan? Public Benefits. A Special Needs Estate Plan will have much of what is in a regular estate plan: Will, Health Care Proxy, Advance Directive, Durable Power of Attorney, HIPAA Release, and perhaps regular trusts. A Special Needs Estate Plan will likely have an additional type of trust - a Special Needs Trust - which is intended to maximize a disabled individual's eligibility for public benefits. There are several types of Special Needs Trusts, such as Self-Funded, D4A, D4C, and Third Party trusts. If you have any questions, please call my office - I would be happy to discuss your situation in more detail. EAEDC (Emergency Aid to the Elderly, Disabled, and Children).